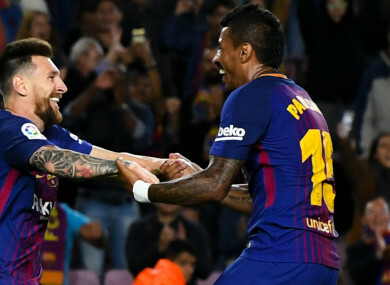 Paulinho was in bullish mood after scoring his second goal for the Catalan club. Lionel Messi celebrates with Paulinho. AFTER MAKING A blistering start to his Barcelona career, midfielder Paulinho is adamant he is not motivated by silencing his critics. The 29-year-old scored his second goal for the club in Tuesday’s 6-1 rout of Eibar following his €40million move from Guangzhou Evergrande in August. Question marks were raised about the decision to sign the former Tottenham man, but he believes he has shown exactly why head coach Ernesto Valverde was so keen to bring him to Camp Nou. “I did not have to prove anything to people who doubted me, just to my team-mates and to Barcelona,” he said. “The best thing is to do it on the field, with victories, with goals. But more than the goals is winning matches. Email “Ex-Tottenham midfielder says he has nothing to prove at Barcelona ”. Feedback on “Ex-Tottenham midfielder says he has nothing to prove at Barcelona ”.